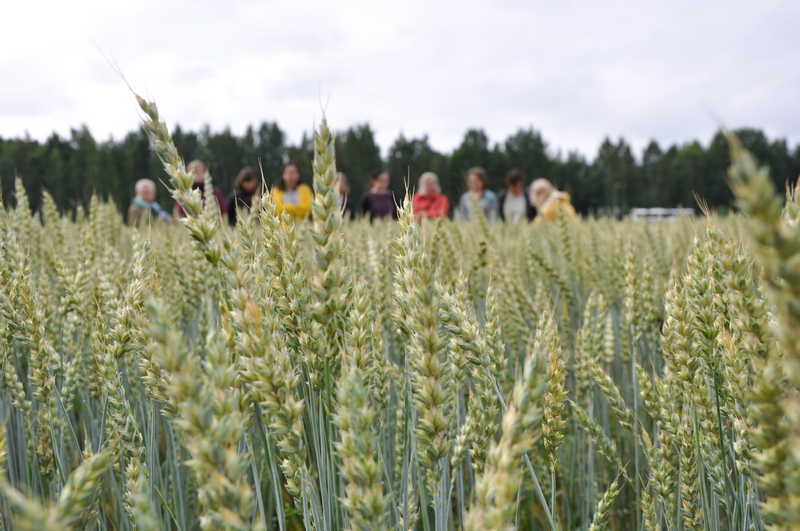 Spring wheat fertilized with acidified pig slurry on the University of Helsinki test plots in Viikki on 23 August 2017. Photo: Kaj Granholm. 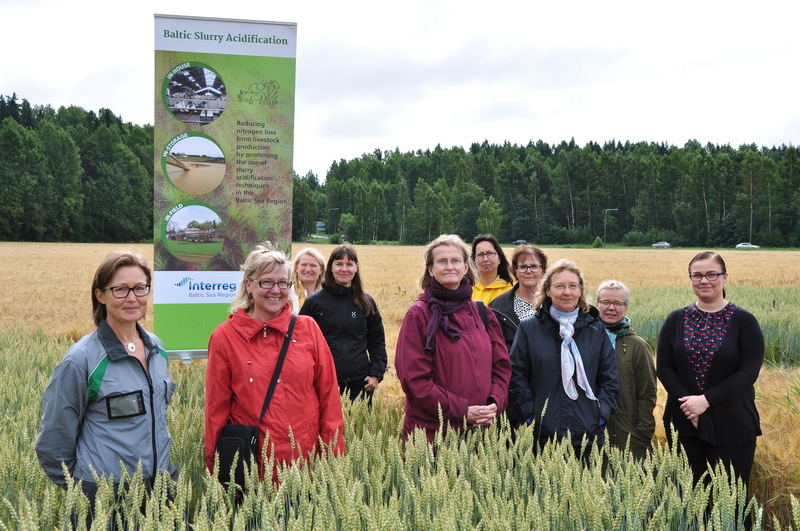 The Finnish partners of Baltic Slurry Acidification project perform field tests with acidified slurry in cooperation with University of Helsinki. The aim of the test is to examine the effect of acidified slurry on spring wheat. 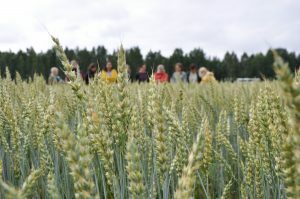 On 23rd of August guests from Ministry of Agriculture, Ministry of Environment and Helsinki Commission explored the test plots in a field event organised by BSAG. In this test, fertilization was done manually on the shoots simulating slurry spreading with a trailing hose. The test plots were divided in four: 1) unfertilized control plot, 2) mineral fertilizer (NPK), 3) untreated slurry and 4) acidified slurry. The early measurement didn’t show notable difference between the fertilized test plots, but the final measurements after harvest will give results on yield, protein content and nitrogen efficiency. The tests are performed by Karoliina Yrjölä, a student at the University of Helsinki under supervision of professor Laura Alakukku. The project is a flagship for the Policy Area Bioeconomy in the EU Strategy for the Baltic Sea Region. Thus representatives of PA Bioeconomy from the Ministry of Agriculture as well as representatives of Policy Area Nutri were invited to explore the field tests. – The acidification of slurry is a very interesting and promising method to reduce ammonia losses. We hope for more infomation and results from the project to support our decision-making when we try to find ways to meet the future emission reduction targets in Finland, says Ministerial Adviser Marja-Liisa Tapio-Biström from the Ministry of Agriculture. Field tests are being carried out in other Baltic Slurry Acidification member countries also. Different kind of slurry on different plants are being tested. The project is now up to speed in testing and can start producing test results and analysis this autumn. The project will end in February 2019.